Guo, Y., Gasparrini, A., Armstrong, B., Li, S., Tawatsupa, B., Tobias, A., Lavigne, E., Coelho, M. de S.Z.S.C., Leone, M., Pan, X., Tong, S., Tian, L., Kim, H., Hashizume, M., Honda, Y., Guo, Y.-L.L., Wu, C.-F., Punnasiri, K., Yi, S.-M., Michelozzi, P., Saldiva, P.H.N. and Williams, G. 2014. Global variation in the effects of ambient temperature on mortality. Epidemiology 25: 781-789. In a study they designed to determine the effects of daily high and low temperatures on human mortality, Guo et al. (2014) obtained daily temperature and mortality data from 306 communities located in 12 different countries (Australia, Brazil, Thailand, China, Taiwan, Korea, Japan, Italy, Spain, the United Kingdom, the United States and Canada) that fell somewhere within the time span of 1972-2011. And what did they learn from this monumental endeavor? 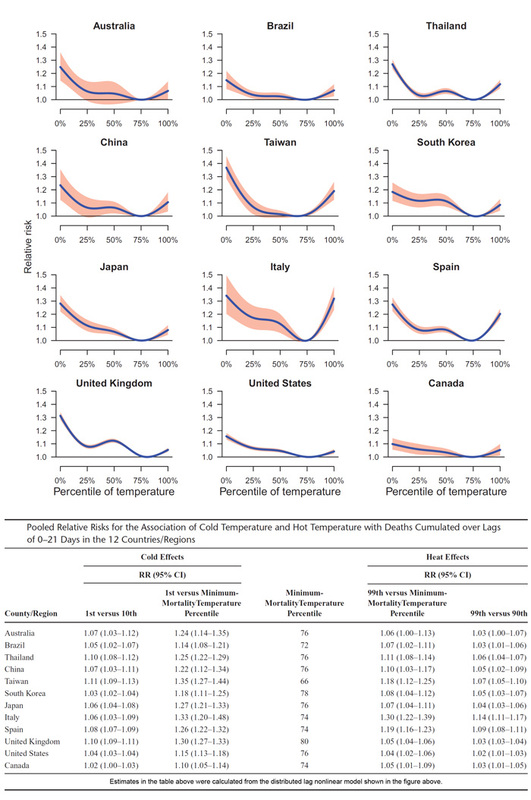 The 22 researchers, hailing from numerous places throughout the world, report that "to obtain an easily interpretable estimate of the effects of cold and hot temperatures on mortality," they "calculated the overall cumulative relative risks of death associated with cold temperatures (1st percentile) and with hot temperatures (99th percentile), both relative to the minimum-mortality temperature [75th percentile]" (see figure below). And despite the "widely ranging climates" they encountered, they report that "the minimum-mortality temperatures were close to the 75th percentile of temperature in all 12 countries, suggesting that people have adapted to some extent to their local climates." Once again, therefore, it is as clear as it can possibly be made, that essentially everywhere in the world, typical cold temperatures are far more likely to lead to premature human deaths than are typical warm temperatures. And because of this fact, we must be thankful for the post-Little Ice Age warming of the world, which has been predominantly experienced almost everywhere at the cold -- and deadly -- end of the planet's daily temperature spectrum. The pooled overall cumulative relation between temperature and deaths over lags of 0–21 days in the 12 countries/regions examined by Guo et al. (2014).